An analysis of observations obtained over 26 years beginning in 1992 have indicated the appearance of sinusoidal variations with a period of about 12 years in the residual deviations of the pulse arrival times (PATs) for the pulsar PSR B0943+10. This behavior in the PAT residuals could be due to the influence of a planet orbiting the pulsar. These observations were carried out on the Large Scanning Antenna of the Pushchino Radio Astronomy Observatory at 112 MHz. Russian Text © E.D. 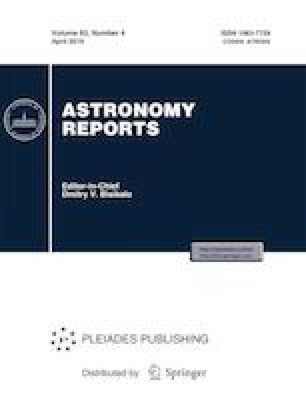 Starovoit, S.A. Suleymanova, 2019, published in Astronomicheskii Zhurnal, 2019, Vol. 96, No. 4, pp. 305–310.